Amman, Zarqa and Balqa R egions, Jordan? the continued dra wdo wn of th e a quifer system will inevitabl y lead to dete r ioration in the parameters investigated. waste water infiltration pollution . 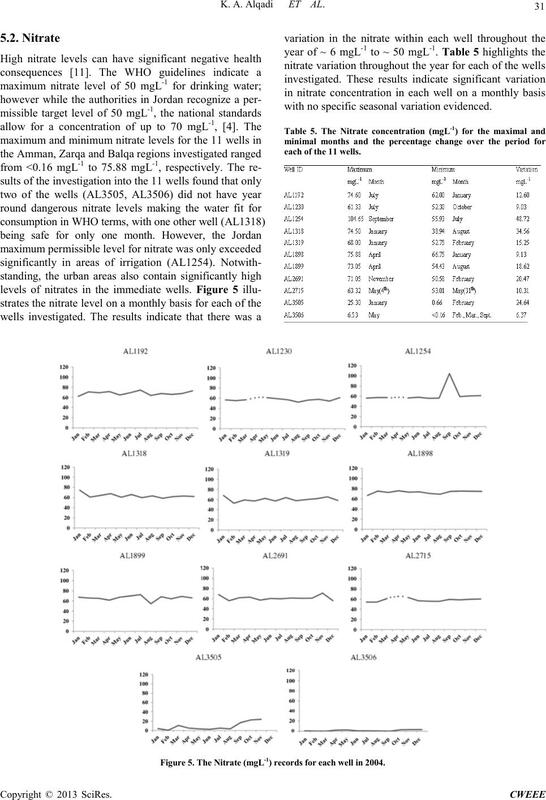 the ground water table and declines in water quality . K. A. Al q a d i ET AL. man-Zarqa B as in . down the Amman-Zarqa sincline . Zarqa Basin for the period 1970-2002. Figure 2. 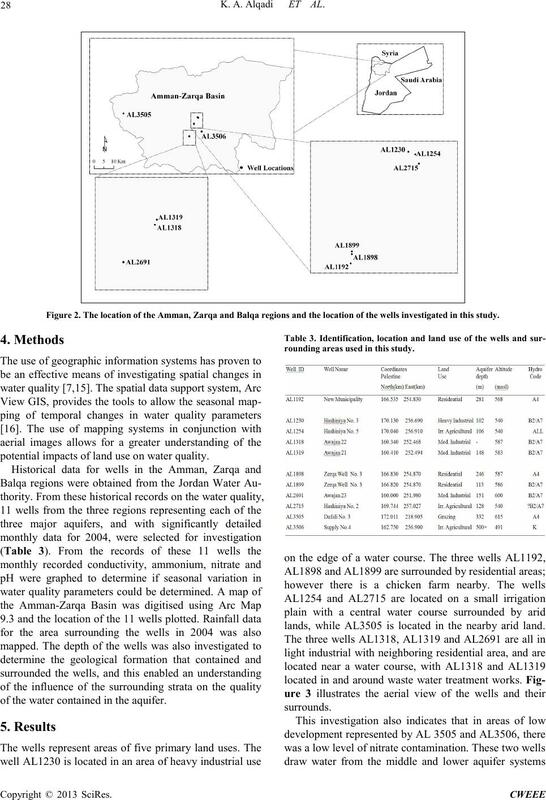 The location of the Amman, Zarqa and Balqa regions and the location of the wells investigated in this study. potential i mpacts of land use on water quality. of the water contained in t he a quifer. rounding area s used in thi s study. lands, while AL3505 is located in the nearby arid land. Figure 3. Land use images showing surrounding areas of each well (from Google Earth, 2004). percentage change over the period for the 11 wells. Figure 4. 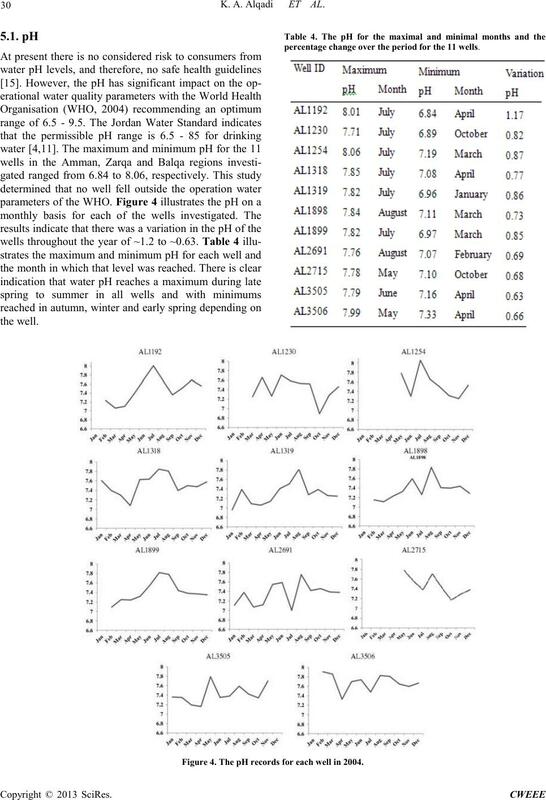 The pH records fo r ea ch well in 2004.
with no specific seasonal variation evidenced. each of the 11 wells. Figure 5. 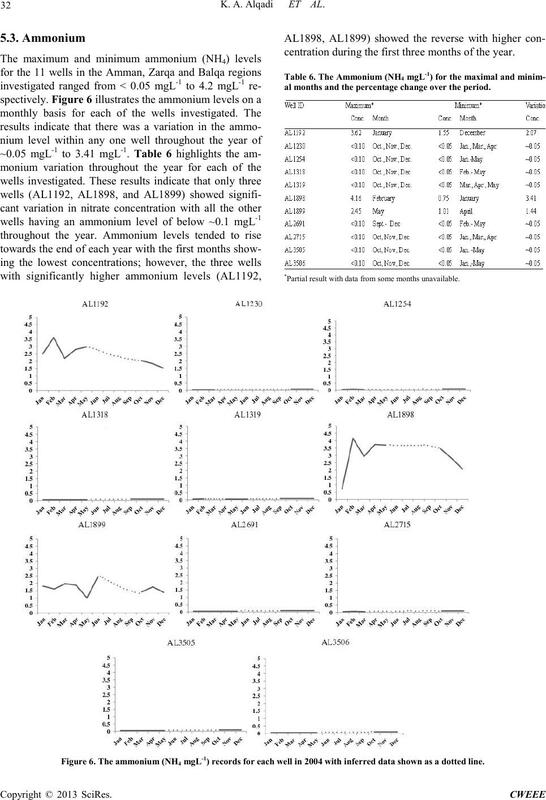 The Nitrate (mgL-1) records for each well in 200 4.
centration during the firs t three months of the year. al months and the percentage cha nge over the period. *Pa r tial re sult with data f rom s ome months unavailable. Figu re 6. The amm o n ium (NH 4 mgL-1) records for each well in 2004 with infer red data show n as a dotted line. and the perc en t a ge chan g e ov er th e p eri od f or each o f the 1 1 wells. *Wel l subject to chlorination during some mo nths. Figure 7. The conductivity (µScm-1) reco rd s fo r ea ch we ll in 2004 with inferred data shown as a dotted line. marked, localised and temporary effect on water quality. exceed the WHO recommendations . when compared to natural rangeland systems [2,10]. 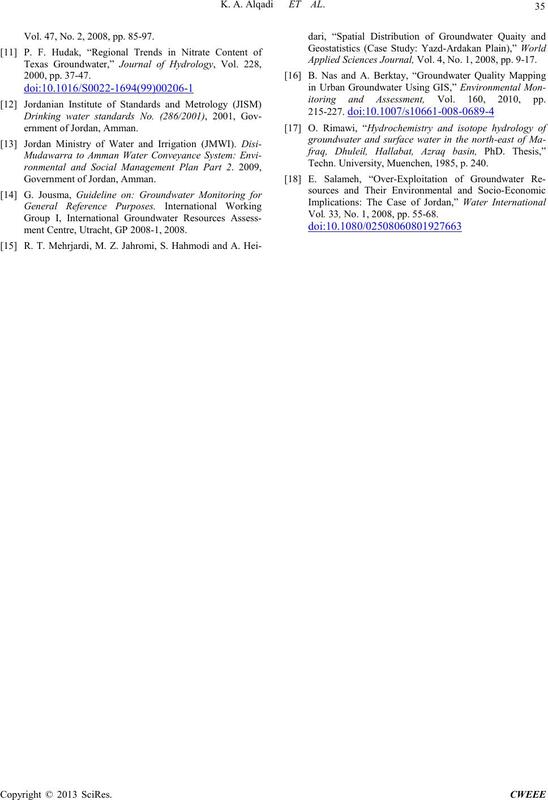 loss of the aquifer system [4,13,18]. 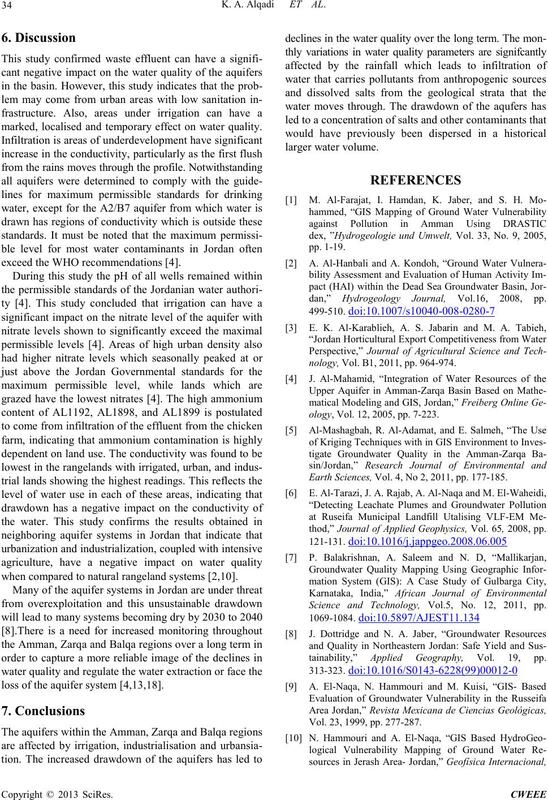 dan,” Hydrogeology Journal, Vol. 16, 2008, pp. nology, Vol. B1, 2011, pp. 964-974.
ology, Vol. 12, 2005, pp. 7-223. 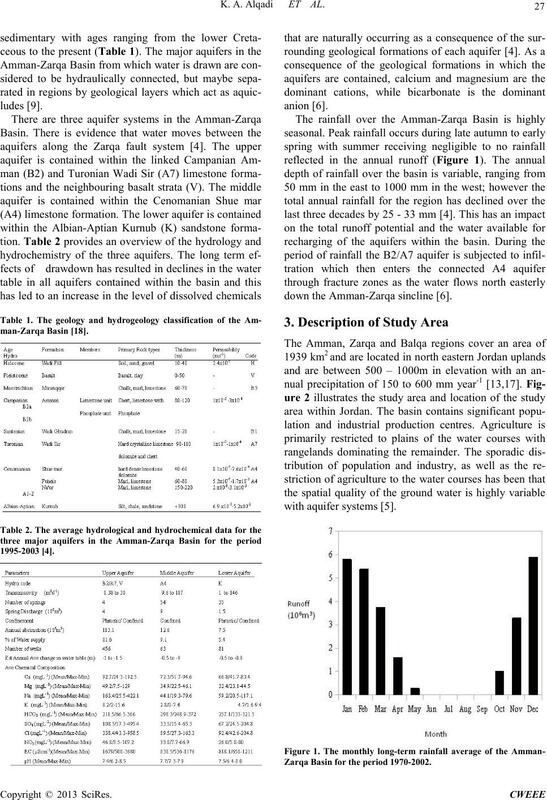 Earth Sciences, Vol. 4, No 2, 201 1, pp. 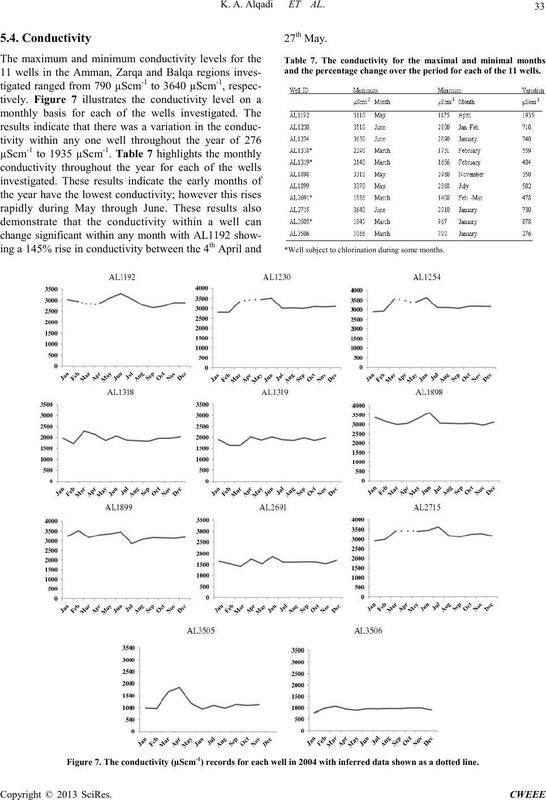 177-185.
thod,” Journal of Applied Geophysics, Vol. 65, 2008, pp. Science and Technology, Vol.5, No. 12, 2011, pp. tainability,” Applied Geography, Vo l. 19, pp. Vol. 23, 1999, pp. 277-287. Vol. 47, No. 2, 2008, pp. 85-97. Government of Jo r dan, Amman. ment Centre, Ut r acht, GP 2008-1, 2008. 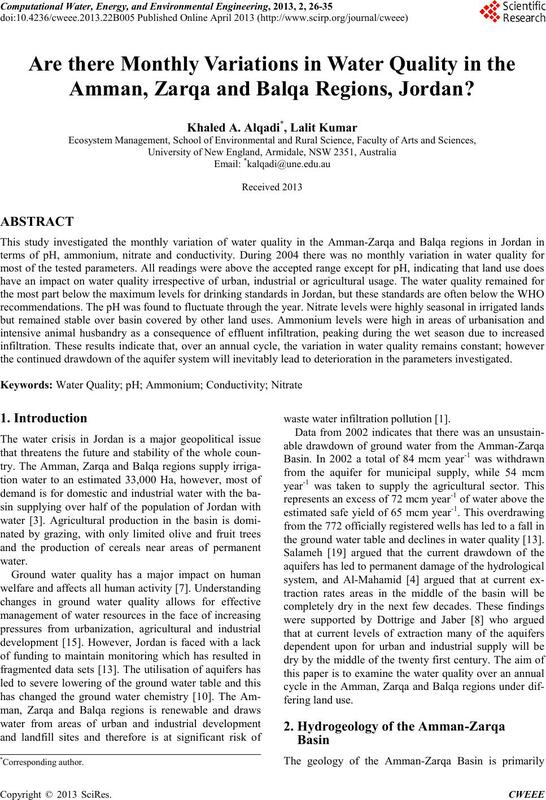 Applied Sciences Journal, Vol. 4, No. 1, 2008, pp. 9-17.
itoring and Assessment, Vo l . 160, 2010, pp. Techn. University, Muenchen, 1985, p. 240. Vol. 33, No. 1, 2008, pp. 55-68.